The speed of your network affects nearly every device on your home network, whether it be a home-theater PC, an external storage device, or a gaming console. For most networks, the transfer rate of a faster ethernet connection (roughly 12.5 megabytes per second) is the typical speed limit. That may be okay for transferring ordinary files, but it's painfully slow if you're trying to back up a PC to a network device, for example, or to stream a high-definition movie to your living room. The solution? Move up to a gigabit network. Switching over to gigabit (1000-Mbps) speeds increases your potential throughput tenfold, minimizing your transfer times and greatly enhancing your ability to stream high-bandwidth files to connected devices without interference. Gigabit networking is now a sufficiently common feature of modern networking devices that it shouldn't carry too great a cost premium. As for your motherboards, the odds are good that they already have gigabit functionality built in, whether you know it or not. Before we go any further, I should note that this guide does not apply to wireless networks; the factors that constrain speeds on wireless networks are entirely different from those that limit speeds on wired networks. How do you determine whether your equipment is capable of handling gigabit networking? And if it isn't, how do you build a gigabit network from scratch? Let's start with the basics. Do you already have a gigabit network? The Windows desktop provides no signal to let you know when you've achieved this superspeedy networking feature. And a lot of factors influence your network transfer speeds--so your gigabit network might crawl along at a data transfer rate of less than 125 MBps for various reasons. You can't tell a gigabit network port from a fast ethernet port just by looking at it. Instead, consult the specification chart or do a little software-driven digging! The most basic requirement of gigabit networking is that all connected devices must be connected via a gigabit port. In addition, they must be connected to each other with network cables that can handle the bandwidth. For devices such as your router, a gaming console, or an external storage device, the quickest way to discover whether they support fast ethernet (10/100 Mbps) or gigabit ethernet (10/100/1000 Mbps) is to check the devices' specifications in their online descriptions or accompanying manuals. Look for a mention of either 'gigabit networking' or '1000 mbps [or Mbps]'. You can check the performance potential of your motherboard's network connection in just a few mouse clicks. Start by pulling up your Network Connections window. Your PC's motherboard is a critical component of the gigabit network. If your system came to you prebuilt or if you don't remember relevant details about the motherboard you used in your rig, don't worry. Click your Windows Start button and select Run (or for more modern-versions of the OS, just point your cursor on the search box and left-click). Type ncpa.cpl and press Enter. The Network Connections window should pop up. Motherboards can vary in how they label the properties of their network controllers. Scroll through the available properties until you find one that identifies the speed of the device. 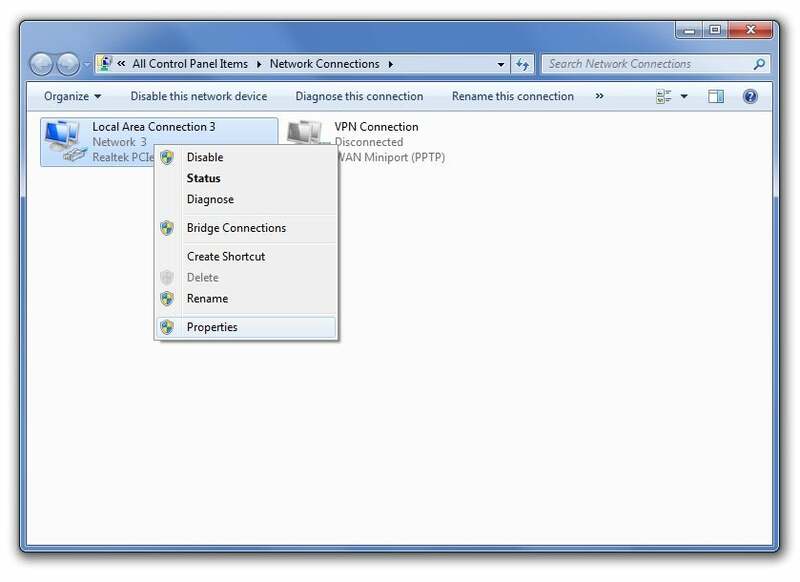 Right-click the network connection listed as your Local Area Connection (LAN), and left-click Properties. Click the big Configure button that appears to the right of the listing for your network controller. In the new window that appears, open the Advanced tab and scroll down until you find a property labeled 'Connection Type' or 'Speed'. Left-click it and then click the Value field to the right. Scroll up and down through this list of options, looking for anything that starts with a '1000' value or anything that refers to network speeds in gbps (or Gbps). If all you see are '100' values and speeds designated in 'mbps' (or 'Mbps'), your motherboard's built-in Ethernet controller tops out at fast-ethernet speeds. 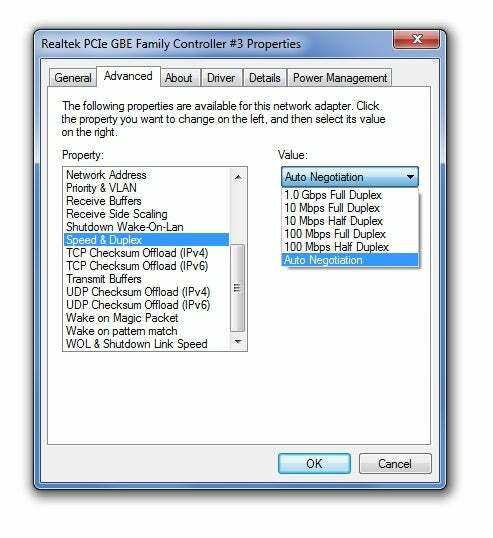 But you can still upgrade your PC to gigabit networking by installing a third-party gigabit ethernet card. If all of the devices on your network support gigabit functionality, great! If a slower, fast-ethernet device joins a gigabit-ready hub, transfer speeds will crawl only when you access that particular device--a slow device connected to a router won't poison the rest. Obviously, if you directly connect a gigabit-ready PC to a fast-ethernet device such as a network-attached storage (NAS) box, you'll get only fast-ethernet speeds. Finally, consider your cables. A typical category 5 (Cat 5) cable supports gigabit ethernet, but it's worthwhile to invest in Cat 5e cables if you're building up a gigabit network from scratch. Plain old Cat 5 cabling is now considered obsolete, and Cat 5e cabling meets more-rigorous specifications, enabling it to do a better job than Cat 5 cabling can of minimizing electromagnetic interference. On the other hand, bumping up your cabling to a classification higher than Cat 5e may not benefit your network speeds. For example, Cat 6 cabling doesn't deliver dramatic speed improvement. To see what kind of cable you have, check the cable's side: The specification information should be printed somewhere along the length of the cord.